For nearly my entire life, I have been caught up in a lie. I believed that because of my meager age of 17 and thereby my position in society that I was powerless. Right now 21 brave American youth, aged 9 to 19, are suing President Trump and the Fossil Fuel industry in the United States for their right to a healthy planet and future. Hearing this really changed my perspective that youth were powerless. The truth is, we are the future, and we cannot count on anyone else to safeguard our future for us. It is our duty to protect our own future. For the longest time I put off publishing this blog simply because I was embarrassed. I thought being “green” was a bad thing – something to be laughed at. Whenever I brought up topics of agriculture, food security, single-use plastics people would scoff and called me a tree hugger. Worse still, my parents and their peers labeled me a “hippie”. It was always “oh you got one of those hippie daughters eh?” They said these words; tree hugger, hippie, earth lover like they were horrible things, unimportant things, silly, little childhood ideals. Caring for the earth we walk on. Caring for the air we breathe. Caring for the complex ecosystems that make up our planet. These concepts were things to be laughed at, like I was full of trivial ideas and that this was just a fanatical “phase”. Like The health of our planet was never to be taken seriously. “You’ll find a real job, right?” they said. As if there was something more important than protecting the very air we breathe, the food we eat and land we inhabitant. And all these little things, they added up, they gnawed away at me. Why was caring for our future such a bad thing? I’m here now to officially tell you it’s not. This blog has been a brainchild of mine sense 2016 but it is only today, April 7th, 2018, that I have officially opened its doors to the world. 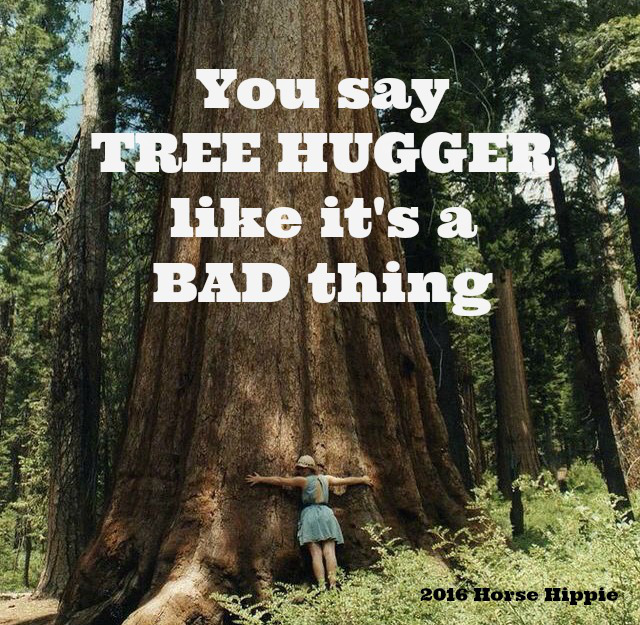 I’ve had these post ideas fragmented in my head for well over two years but I never thought it was necessary to share my thoughts, after all, being a tree hugger, being a stereotypical “hippie” wasn’t a good thing – according to society. Let’s take a look at the persona of a stereotypical hippie for a moment. Here is the definition of a “hippie” straight from Google; “hippies declared their willingness to question authority, and distanced themselves from the “straight” and “square” (i.e., conformist) segments of society. Personality traits and values that hippies tend to be associated with are “altruism and mysticism, honesty, joy, and nonviolence“. Let’s break these terms down a bit now, shall we? Altruism; the belief in or practice of disinterested and selfless concern for the well-being of others. Now, I don’t know about you but those qualities all sound pretty good to me. See, somewhere in our history we began to see these values as bad, useless, unimportant and frivolous. We began to question and scrutinize people who were truly at peace with themselves and their lives, who were selfless, happy, who respected the land they walked on. We began to segregate and abolish those did not participate in our corporate and capitalist economic system. We shunned those we protected our earth’s various resources because it hindered our immediate profit and economic growth. Let’s look at the type of individual most valued in today’s society; the consumer. A typical consumer buys stuff, lots of stuff at the cheapest cost they can because, well, that’s how our system is designed. They are told they need this stuff and so they buy it and over and over the cycle continues. The corporations’ profit and everyone else is plagued with poisoned rivers, polluted airs, acidified oceans, monoculture landscapes, a loss of food security [links for all these to other posts] and overall, the consumer has a real lack of true satisfaction in their life. Which type of person would you rather be? Talk to? Marry? Work with? See this type of thinking is what I had been searching for every “environmental” blog I could find. I saw their tips for new light bulbs and walking more often, little things like that. Some were better, they talked entire lifestyle changes like making everything from scratch. And these tips are good, they inspire, they create awareness, invoke tangible change and they reduce that singular person’s carbon footprint. So why did I feel something was missing? That is when I realized something, a critical difference; when I was going through all these other blog’s tips I realized, changing my light bulbs won’t singlehandedly save the world, neither will growing my own food or going zero waste but that’s exactly what these blogs were saying. There was no real, long-term change being made. Sure, for that one person, living zero waste, not owning a car, being a minimalist, living in a tiny home or perhaps being vegan their life is completely changed, and they can see it, touch it, feel it. And maybe that’s the difference, see, these immediate, tangible changes that we make to our lives feel good, and do good – but it’s not enough. We must also do the hard changes, the ones that take years and never seem like anything is happening. The political changes, the mindset of society changes, the economic changes. In order to have long-term environmental change, we must not only reduce our own carbon footprint but also change the global legislation to safeguard our planet. So now you know why I’ve created this space, why I’ve wasted the past 5 minutes of your life reading over 1,000 words. I want you to know how to create real, long-lasting change, not just the fluffy stuff everyone else will tell you. I want to reinvent our green movement. Together, we can be the green revolution, but we must act. We must do more than look at our screens and move our thumbs to the like button, we must do more than reduce our own carbon footprint. We need to change legislation. We need to hold meetings to not only discuss but invoke change. We need to rally, you and I, across the globe to protect back our future, to protect our water, our air, our land, our food and our wildlife. This email list will allow us to stay connected and, with your help, rally local and international conservation groups to align with us as well. Now times that by 10, 100 or 1000. Now imagine what 7.6 billion people could do. That is how we’re going to change the world. Hand in hand, one at a time, together; we are the green revolution. For now, I just have a bit of homework for you; find the most pressing environmental issue in your local community (could be your town, city or even just your street) and tell me it via projecthippie@gmail.com or @projecthippie_ on Instagram.